How many of these comic book tie-ins have you played? We are not sure if you've heard but a certain DC Comic icon is set to have people piling into their local cinemas to watch the concluding part in Christopher Nolan's Batman trilogy, the Dark Knight Rises. There is of course one place the bat will always live on and that's in the console world. As the Dark Knight prepares to sweep down onto the big screen for the last time (at least from Mr Nolan that is), we pick the comic book inspired video games that truly did justice to its artwork origins. Without doubt one of the finest comic book video game adaptations in recent years, Spider-Man 2 was released to coincide with the film of the same name and broke the cycle of terrible movie to video game adaptations providing gamers with a sandbox New York to web sling around, filled with a variety of engaging missions and characters. 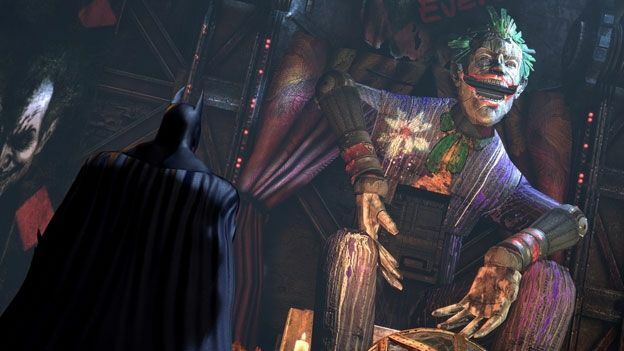 Arkham Asylum and its sequel, Arkham City, have really set the standard of superhero gaming this generation, boasting a robust combat system, stellar graphics engine, a great story and overall just fantastic gameplay. The critically acclaimed first was only topped by its sequel which provided a massive world to explore for the caped crusader, albeit at the expense of a more focused story. Still, both games are diamonds among the rough sea of videogame comic book tie-ins. The second Spiderman entry on the list, like Spiderman II, Ultimate Spider-Man was a sandbox web slinger fighter, but with a twist. Taking on a cell shaded, comic book-esque aesthetics, Ultimate Spiderman let you play as both Peter Parker and his alter ego Spiderman as well as Venom, Spiderman's arch nemesis, with varied gameplay for each character. Ultimate Spiderman really delivered the comic book experience and featured an all-star cast of featuring the rest Marvel Superhero fraternity. The spiritual prequel to the unrelated popular franchise Prototype, is another sandbox free roaming game only this time you're roaming as The Hulk. At the time the utter destruction and carnage you could cause as the not so friendly green giant was unprecedented. It lead to hours of time spent running up buildings, throwing cars and picking up tanks to smash OTHER tanks with. If you don't have memories of playing Teenage Mutant Ninja Turtles: Turtles in Time either on the SNES or an Arcade, well, you missed out. Featuring some fine four player co-op action, Turtles in Time is a complete nostalgia trip for most gamers but for those who haven't experienced it it was one of the great beat 'em up's of its time and has recently been re-made for modern consoles.